Holy cow! Personally, I always found it generally difficult to sweep a team in professional sports. It ain’t easy in baseball, even at the collegiate level. When you’re the one busting out the brooms it’s a great feeling, but conversely it really hurts and can set a team back. For Miami, it only made the hole bigger. The Marlins traveled to the city of brotherly love where they’d got everything but that, getting effectively dominated to extend their woeful losing streak to six. The opener saw Justin Bour belt his 17th home run, a 2-run jack to put the team ahead after four frames. Then in the ninth, Kyle Barraclough fell apart for his sixth blown save of the year as Philadelphia exploded for four runs, including a game-winning three-run bomb by Maikel Franco. 5-2, Philly. Game 2 saw an anemic offense contribute a single run in the eighth, ruining an otherwise good outing by Trevor Richards ( 5 IP, 4 Hits, 1 Earned Run, 7 K’s). Miami’s bullpen gave up three late, losing 5-1. It wasn’t Javy Guerra’s night. Whatever shackles the Phils offense had were shattered in game 3. Behind four round-trippers, the NL-East rivals slammed the Fighting Fish 8-3 with Jose Ureña falling to 3-11 with a 4.66 ERA on the season. Justin Bour and Miguel Rojas were the lone bright spots. Their homers were the only run production the team could muster, on four hits might I add. Dan Straily took to the mound in the finale hoping to end the skid. Despite his best efforts ( 5.1 IP, 1 Hit, 2 Earned Runs, 7 K’s) and a three-run rally in the seventh to tie the game, courtesy of Derek Dietrich and Bour’s going long, the high flying Phillies answered with another dinger by Asdrubal Cabrera in the bottom of the eighth inning to sweep the Fish, 5-3. Frustration is one way to put it. The ballclub then limped home for a tilt with the St. Louis Cardinals. The good news is Wei-Yin Chen continued his curious dominance at Marlins Park, lasting nearly six innings, holding the Cards to a mere hit. Brian Anderson helped Miami jump to a very early 1-0 lead with an RBI single, cushioned by a solo shot by Starlin Castro in the fourth that proved juuuussstt enough to squeak away with this one, 2-1. Barraclough struggled once more, loading the bases and even walking a guy to bring St. Louis to within one. Luckily, Yadier Molina grounded into a 6-4-3 double-play. Hallelujah! Chen improves to 4-8 with a still ugly, 5.48 ERA. So what’s the bad news? The losing streak is gone but our woes remain. 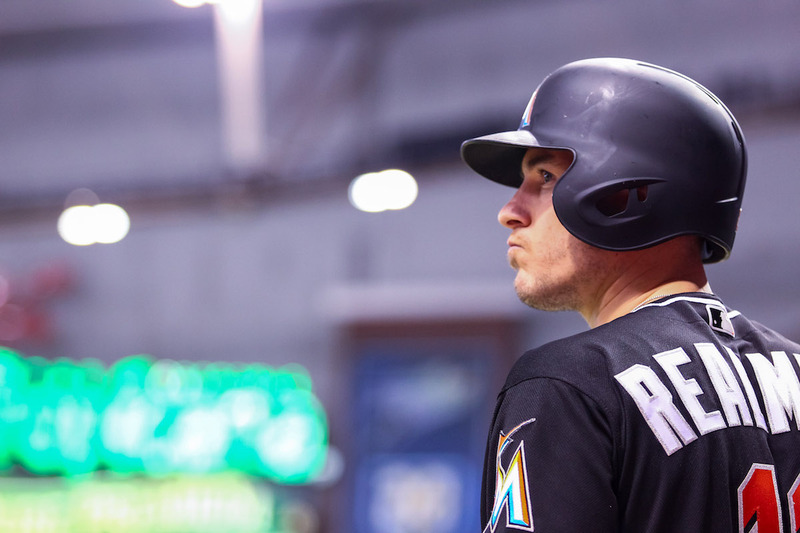 Tuesday night’s game started on a positive note with Bour scoring in a run with a line drive. Rojas mimicked an RBI-single of his own, scoring JT Riddle in the process. However, Paul Dejong went long, tying the game 2-2 before Matt Carpenter smacked his league-leading 30th homer in the eighth to end our short era of good feelings, St. Louis 3, Miami 2. Again, the power-hitting fried the fish. The rubber match left little to be desired. The Marlins were once again ice cold at the plate, amassing three hits and one run. Richards held his own, allowing three runs in five and two-thirds, but it was more than enough, the Cardinals escaped Miami, winning 7-1. Will the real Marlins please stand up? Ever since the series against Washington, the squad has been pretty much nose diving. Looking back at the last 10 or so games, one can see what the problem is, or rather the main problem. I’m super tempted to say everything but that wouldn’t tell the whole nitty gritty story. Barraclough hasn’t recorded a save since July 21st. Since then he’s had three straight blown saves, the tip of the iceberg. In 4.2 IP he’s allowed 13 hits and surrendered just as many runs. 13 earned runs. 13. This was unthinkable a month ago. Since the Braves series at the end of July, the pitching staff has allowed 50 runs. In nine games. 15 of those runs were late in the game, from the eighth inning on. The main problem is the hitting. .185/.210/.297, look at those numbers. This isn’t an individual player’s slash line, it’s the team’s. For the month of August the offensive output has gone comatose. From the Braves series starting on July 30th to Thursday night, the team has been outscored 50-23. It doesn’t matter what the pitching does, you don’t win at all with these numbers at the plate. All it takes is one, maybe two runs and Miami loses. Come on, when you look at the players themselves you can see the biggest offenders. Rojas in his last seven games, batting .235, Castro .208, Riddle .125, Martin Prado .087. I mean heck, even Realmuto doesn’t escape this, .074. The only player that’s been absolutely, without question, bucking at this dismal trend is Dietrich, batting .346. He sure showed me. For those who are wondering, Bour is hitting .240 but he’s slugging .600 with 3 HRs and 5 RBIs in the last 7 games. He is certainly contributing. Anderson for his part is hitting .259 in the same span. Maybe they’re in a rut and just need time to heat up. Maybe they’re still recovering from losing Brad Ziegler and Cameron Maybin. Or, maybe these are the real Marlins after all. One thing is for certain, Miami, we have a (growing) problem. A big one. Wei-Yin Chen is having a sort of Dr. Jekyll and Mr. Hyde kind of season. In 18 starts, he’s split evenly with nine at home and nine away. On the road, Chen sports a horrific 10.27 ERA. Back in Miami? His ERA is a cool 1.94. Going a bit further, opponents are cranking a .350 batting average when he’s the visitor. But when they come to his house, they’re held to .193. Go figure, eh? We all know someone that does this. So in this little segment, I will occasionally check up on Ex-Marlins. Specifically, the two we traded just before the deadline and those before the season. Brad Ziegler’s homecoming was a bit of a rough start. On August 2nd, he got batted around by the San Francisco Giants, giving up four runs on three hits. But since then he’s made three more appearances and is holding steady. As for Cameron Maybin, in his last 7 games, his slash line is .222/.250/.222 with 6 hits in 27 At-Bats and 2 RBIs. I’ll check up on our former outfielders on the next installment.